Comm Eye Health Vol. 14 No. 40 2001 pp 60 - 61. Published online 01 December 2001. Blindness and low vision are major causes of morbidity and have profound effects on the quality of life for many people. They inhibit mobility and economic well-being of the individuals affected as well as their families. Childhood blindness (CBL) is one of the challenges faced by the world generally and developing countries in particular. In industrialised countries, certain mechanisms for normal schooling and socio-economic rehabilitation of visually impaired children exist. However, in developing countries due to scarce resources and traditional taboos, these children are rarely able to attend the normal educational institutions. Vision 2020: The Right to Sight, has recognised CBL and low vision and refraction as important strategic themes for control of avoidable blindness. This paper attempts to provide some guidelines on how a low vision programme for children could be set up in a developing country. Anne Corn, in 1989, defined Low Vision as “a level of vision that with standard correction hinders an individual in the planning and/or execution of a task, but which permits enhancement of the functional vision through the use of optical or non-optical devices, environmental modifications and/or echniques”. Natalie Barraga, in 1983, designated children with low vision as those who have limitations in distance, but are able to see objects and materials within a few inches or at a maximum of a few feet away. There is now an increasing acceptance of a behavioural function rather than a medical basis for low vision. However, children in developing countries are rarely encouraged to develop the use of residual vision and its existence is often ignored by medical² and education staff. The challenge for us is to recognise ways which allow partially sighted children to benefit from their residual vision through the provision of appropriate services, aterials and devices. The need can be established using direct or anecdotal evidence. This may be in the form of census surveys that give the proportion of children under 16 years, national prevalence of blindness surveys, surveys of schools for the blind, blind registrys, and regional estimates of prevalence of childhood blindness. The mean global prevalence of childhood blindness/severe visual impairment (BI/SVI) is 0.75/1000 and the prevalence of low vision is about twice that number.2 While establishing a need at national level, it is also helpful to determine the magnitude at the provincial and district levels where appropriate. The next step in the sequence of planning is to conduct a situation analysis of the available infrastructure (eye care services, education institutions, social welfare services, organisations of and for the blind). Human resources available for service delivery to the visually impaired at tertiary level (ophthalmologists, optometrists, special education/resource/itinerant teachers and orthoptists), at secondary level (ophthalmic medical assistants, nurses, refractionists, teachers, orientation and mobility instructors) and at primary level (community based rehabilitation workers, community health workers and social workers) are assessed. Appropriate technology opportunities available, i.e., current level of optical services and its capacity to produce assorted low vision devices, are noted. The situation analysis should also identify what current legislation/laws ensure the rights of disabled persons and how they can be utilised effectively. The situation analysis will identify the most suitable cadres at the tertiary, secondary and primary levels on whom the service can be based. The review of the infrastructure will determine where the services will be based so as to ensure maximum utilisation. An analysis of the technology available will help in determining what can be produced/procured locally and what will be needed from external sources. As a precursor to a low vision programme, a concept will have to be developed that determines what is available and what needs to be achieved over a certain period of time, and the difference between these would be the gap analysis. This could be in the form of training that needs to be imparted to existing cadres to be able to perform a low vision assessment,3 prescribe low vision devices (LVDs) or manufacture low cost LVDs.4,5It may also involve determining means and ways to make the best use of existing infrastructure, e.g., space in an eye department for a low vision clinic. The situation analysis and the gap analysis together will form the basis for development of a plan for low vision services for children. Usually, this forms part of a more comprehensive low vision programme. It is useful to define short, medium and long term objectives. Examples of short term objectives could be training of core cadres in low vision, awareness workshops for eye care professionals, and including a low vision component in existing training programmes, e.g., paramedics and teachers, and standardising curricula to incorporate low vision. Medium term objectives may include establishment of low vision clinics, networking of service providers, and development/enhancement of the local capacity to produce LVDs. In the long term, the low vision concept and component should be fully integrated into a national comprehensive eye care programme with a measured increase in the quality and coverage of service. Even though the main emphasis on developing a low vision programme remains the best and effective utilisation of existing resources, nevertheless, some external support will still be required in the form of training of national focal/resource persons in low vision and setting up of low vision clinics (supply of equipment). The different components of the plan (short, medium and long term) should be costed and funding sought from the government, non-governmental organisations, community based and service organisations and commercial enterprises willing to support programmes for disabled persons. As in most new programmes, it is better to pilot the plan first in a defined setting or area to test the concepts proposed and identify deficiencies. The piloting phase could conceivably be done by identifying a district that has a secondary level eye unit, availability of optical services and an educational institution willing to participate in this programme. Access to a tertiary eye department and existence of an on-going community based rehabilitation programme in the area are definite added advantages. Simple optical and non-optical low vision devices and assessment materials can be produced in most countries where basic optical services exist. The assessment materials can be developed using a desk top computer with laser printer. A semi-skilled technician with basic optical knowledge can be trained in a short time to produce low vision devices. Most of the materials involved in the production of low vision devices are usually available locally and may include PVC pipes and optical lenses. The issue of non-availability of optical lenses in higher power and aberrations associated with these lenses can be overcome by combining 2 or 3 low powered lenses to produce a higher power system. The role of low vision service as a bridge between medical, educational and rehabilitative services has been recognised. The low vision centre in the district can act as a referral point for the child to access other services that may be required, e.g., orientation and mobility training, early intervention, and peer support groups. One way in which this could be brought about is to hold networking meetings between the different service providers and develop a consensus on the methods for detection of the visually impaired child in the community, referral to a low vision clinic for assessment and prescription of LVDs, appropriate placement in school, access to statutory benefits and elimination of barriers to care. The lessons learnt from the piloting phase can then be employed to develop a larger programme within the framework of a national Vision 2020 programme. This will ensure its lateral integration with other eye care related activities, removing the need to set up a vertical programme, and so promote its long term sustainability. The low vision programme thus developed as part of a national comprehensive eye care plan should be dynamic in character with an ability to absorb changes in technology, move towards sustainability and have within it a mechanism for reporting, monitoring and evaluation. The goal should be to increase the coverage of the service and continually improve its quality. Most specialties in ophthalmology are costly to develop and require specially trained people and sophisticated equipment. Low vision as a specialty is one area that can easily be initiated in any ophthalmic, educational or optometric set-up with a minimum of investment and training. Most of the devices used for assessment can be produced locally using indigenously available materials and appropriate technology. The use of simple magnifiers can help children pursue education in normal stream schools and improve their quality. Each country can identify its own relevant existing human resources and train them in a short period of time to provide low vision care in a school, hospital or clinic setting. 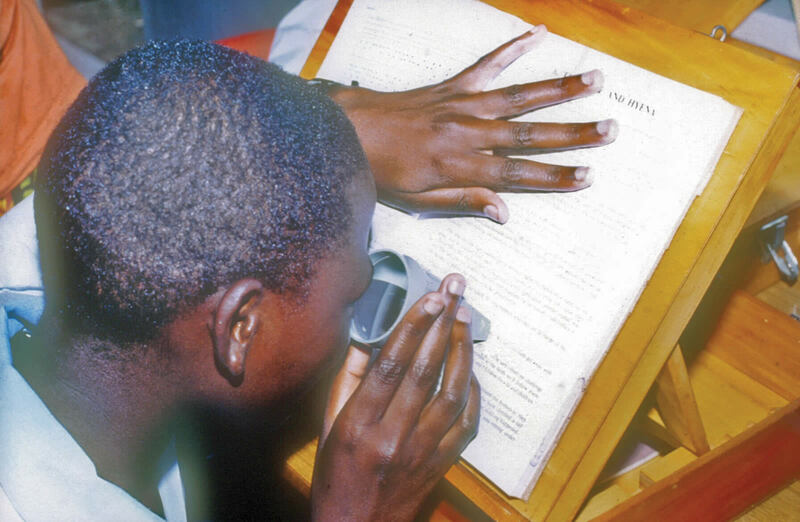 Standard manuals on production of inexpensive low vision devices can provide instruction in making these devices. As experience is gained, and with some input from external sources, a cost effective and sustainable low vision service can be developed. It would be preferable to plan the development of any such service so that it is capable of fitting in the ongoing national health, educational and social welfare programmes. This will not only ensure its sustainability and cost containment but also its early acceptability and implementation. 1 The Management of Low Vision in Child-hood. Proceedings of WHO/PBL Consultation, Bangkok, July 1992. WHO, Geneva, 1993. 2 Prevention of blindness in children. Report of a WHO/IAPB scientific meeting. Hyderabad, April 1999. WHO/PBL/00.77. 3 World Health Organization. Assessment of low vision in developing countries. WHO/PBL/ 95.48. 4 World Health Organization. How to make spectacles at low cost. Spoerer P. WHO/PBL/ 95. 50.